Everyday markets can go up or down. Compared to other asset classes like Cash or Bonds overtime the equity market trend is undeniably up. Unlike the ASX 50 which is only 50 largest companies listed on the ASX. 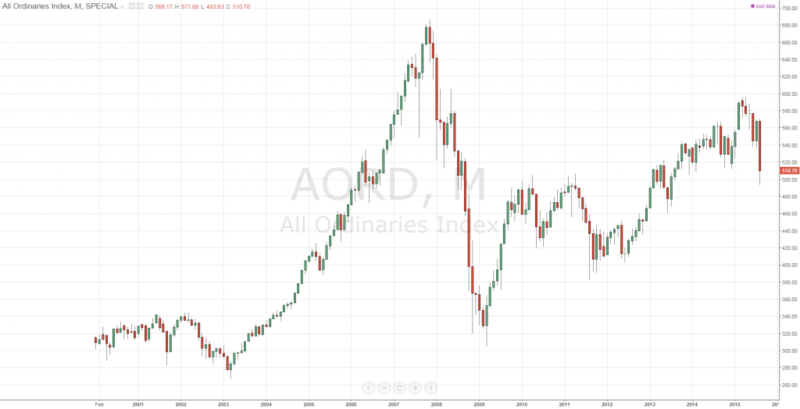 The All Ordinary Index is a market cap weighted index which includes all listed companies on the ASX. Chart below shows the All Ords Index History going back 15 years from 2000 on a monthly time frame. It shows that we have not overtaken the 2007 peak highs. Even 5 years after the GFC. The quick recovery in commodity prices during the financial crises did not lead to new record highs for mining stocks. Shares of miners like BHP and RIO Tinto peaked in 2012 and have been in a bear market since. Since the decline in commodity prices, LNG was suppose to be the next export boom for Australia. However the decline in oil price has put that idea to bed. LNG producers like Origin energy share price has been under severe pressure based on the low oil price. The upcoming LNG supply is expected to overwhelm market demand across the region. However on a long time frame the chart below shows the 2008 crash in context. The trend is still up. You can also see the 1987 cash in the lower left of the chart. This index does not include the dividends investors would have collected over time. The take away from looking at the long term chart is that it pays for investors to overlook the short term pain and stay in the market for the long run. The long run performance of equities outpaces all other asset classes by a significant margin. All Ord Index history shows long term investors holding equity in the their superannuation benefit from the power of compounding with a long term investment horizon and advantage of owning one of the best risk adjusted asset classes. Investors with limited knowledge of markets can use ASX index funds to gain exposure to broader market without picking specific stocks. This is the best way for retail investors to gain long term exposure to the market.